Band in a Box 2019 Audiophile-Ed. PC, dt. Band in a Box 2019 MegaPAK PC, dt. 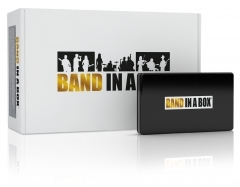 Band in a Box 2019 Pro PC, dt. Band in a Box 2019 UltraPAK HD-Ed. PC, dt. Band-in-a-Box 2018 Audiophile-Ed. MAC Upg./Cross.von Audiophile, dt. Band-in-a-Box 2018 Audiophile-Ed. MAC Upg./Crossgr., dt. Band-in-a-Box 2018 Audiophile-Ed. MAC, dt. Band-in-a-Box 2018 MAC PlusPAK Upg. von 2017, dt. Band-in-a-Box 2018 MAC PlusPAK Upg. von 2017, engl. Band-in-a-Box 2018 MegaPAK MAC Upg./Crossgr., dt.